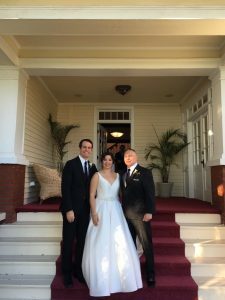 With an absolutely beautiful setting at Palmetto Riverside Bed & Breakfast this weekend, Melissa and Troy’s charming outdoor wedding was an amazing experience! The owners at the B&B, hosted a charming and spotless affair for the happy couple and guests. As you walk around the property, you understand how much love and care is poured in by all. Grant Hemond provided flawless DJ services for both the ceremony and the reception. Alisa Sue offered the happy couple professional photography, capturing fantastic moments the whole evening. Day of coordination was offered by Jamie Metzger, who was “on the ball”, running the whole event and did a fantastic job. Mellisa and worked alongside Pastor Brian Jones of Sensational Ceremonies to create a custom ceremony that allowed them the chance to express their personal taste and feelings. A perfect day all around!